Psoriasis is a chronic, immune-mediated skin disease shown to have a multifaceted relationship with psychological factors. Because these factors have been shown to both worsen and result from psoriasis, an increasing number of studies have sought to investigate the efficacy of various psychological interventions in psoriasis management. A systematic review of PubMed® and Scopus® databases was performed for studies investigating psychological interventions in psoriasis management published from 1 January 1990 through 4 November 2018. Primary articles published in English and conveying physical treatment outcomes were included, whereas articles not describing clinical outcomes were excluded. Studies supporting intervention efficacy were graded with a level of evidence according to the Scottish Intercollegiate Guidelines Network levels of evidence. 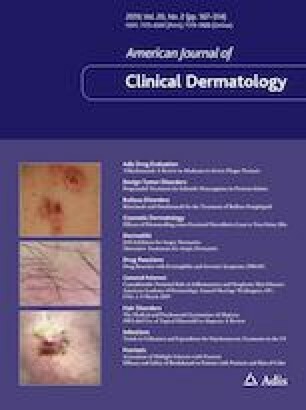 A total of 28 reports studying 27 unique sets of patients receiving psychological therapies in psoriasis management were identified, including three case reports and series and 24 clinical trials, investigating 1522 patients in total. Cognitive behavioral therapy and its variants, biofeedback, meditation and mindfulness-based therapies, hypnosis, music resonance therapy, motivational interviewing, emotional disclosure, and educational and multidisciplinary approaches have been studied in the treatment of psoriasis. Although 16 randomized controlled trials were included in this review, literature is limited by heterogeneity of methodology, analyses, and outcomes. Only 4 of 27 studies (three of which investigated cognitive behavioral therapy) were rated a level of evidence of 1+ or greater. Studies, overall, have sample sizes often < 50 patients, lack follow-up past 12 months, and have attrition rates > 20%. Based on assigned levels of evidence, the most promising methods of psychological intervention in psoriasis include cognitive behavioral therapy, mindfulness-based therapies, motivational interviewing, and educational and interdisciplinary interventions. Further study is needed to determine the efficacy, practicality, and economic feasibility of these treatment options for patients with psoriasis. The online version of this article ( https://doi.org/10.1007/s40257-019-00437-7) contains supplementary material, which is available to authorized users.